Seven years ago Allison Welder did something that changed her life. After 10 years of successful research on the effects of cocaine and steroids on the heart, after countless professional articles and chapters written in books and after winning dozens of awards and grants, Welder said she fell into a mid-life depression. "I just kind of went through a depressed period because the research wasn't doing it for me anymore," Welder said. At the time she was an associate professor of pharmacology and toxicology at the University of Oklahoma College of Pharmacy. During a class one day she opened up to her students about her depression, to which one said, "Maybe you should get a puppy." The seemingly off-the-cuff remark resonated with Welder. It turned out the student's Labrador retriever had 12 puppies and soon Welder was picking out a chocolate brown puppy of her own. "I went over and adopted a little runt, LuLu. She just changed my life," the professor said. Not long after, Welder saw an article about dogs working in healthcare environments as emotional therapy for patients. "It was one of those God moments where you know you're supposed to learn something," she said. 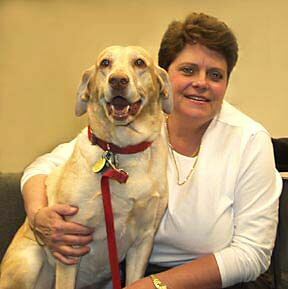 Soon Welder was training her growing number of dogs -- she adopted yellow lab Tinker-Belle and found black lab Abbie, who was abandoned on the side of the road -- in the ways of animal therapy. She certified all of her labs in national and international animal therapy organizations including the Delta Society, Therapy Dogs International and Therapy Dogs Inc.
With certifications in hand she set out to her local healthcare agencies to bring her dogs to the sick and healing, dubbing her work Therapy on a Leash Inc. "It really changed my life," Welder said. "I was very successful publishing and in research. It was never enough. There was always another grant to write, another paper, another award to get. It just wasn't filling that hole. "It's good enough for me, so to speak ... It was difficult to give myself permission to change." Unfortunately, Welder said she didn't receive much support from her professional peers or from the community at large. She said people were unaccustomed to seeing therapy dogs in healthcare settings. The professor would encounter trouble with regulations such as rules barring dogs from elevators in hospitals. In December 2000, the professor decided to relocate to Las Vegas where she got a position teaching at the Nevada College of Pharmacy. The position allowed her to focus on teaching, something she loves, leave research behind and devote more time to Therapy on a Leash. Welder quickly registered her dogs with K9 Therapy Dogs of Las Vegas and began volunteering her Friday afternoons at Nathan Adelson Hospice. To her delight, Southern Nevada is far more hospitable to using animals in healthcare. "The Las Vegas area is very open and accepting and values animal therapy," Welder said. Those at the local hospice seem to agree with her. Sharon Williams, a hospice administrator, said there are several people who volunteer once or twice a week to bring their animals for therapy. On a recent visit, nurses and staff cheerfully greeted 4-year-old Tinker-Belle, who was sporting an official Nathan Adelson Hospice volunteer badge complete with a photo, while she and Welder made the rounds to patients. "You can see just from walking around that it's not just the patients that get a kick out of the dogs -- it's the nurses, too," Welder said. Licensed Practical Nurse Josie Tillman said she loves dogs and enjoys visiting with them on Fridays because her husband is allergic to dogs. "The residents really enjoy when they come," Tillman said after getting her face heartily licked by Tinker-Belle. "The majority of our patients really like pets." The nurse said she frequently notices a difference in her patients following a visit from one of hospice's volunteer dogs. "If it's something they love they spend their last days enjoying things they love," she said. Welder has another way of putting it. "To watch the healing between the dogs and the patients is magical," she said. "They're basically angels in dog suits." Those interested in learning more about Therapy on a Leash can go to the Web site at www.therapyonaleash.com.